These are amazing black iridescent pumps with a fun twist! 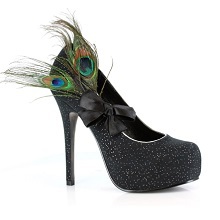 The shoes are decorated with a black satin bow and bright Peacock feather and sky high 5″ heel. Available in size 6-10. These shoes are mailed separately from your order and will arrive in approximately 5-7 days. There is a 15% restocking fee if you choose to return.